HOW CAN I KNOW YOUR JESUS? Covenant Messenger Ministries sponsors a team of four evangelists who regularly go to cities and villages in various parts of Ghana to pass out Gospel tracts (pamphlets), explain salvation through Jesus Christ and pray for healing for those who are afflicted with sickness and other infirmities. 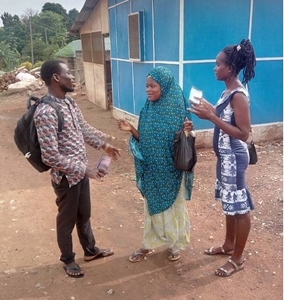 In May of 2018 the team went to in a small village in the eastern region of Ghana called Akyem Asafo and in pouring down rain that day, they still managed to give out 207 Gospel tracts to anyone who would accept them. Through the efforts of the team and by the anointing of the Holy Spirit, 69 people were introduced to the Gospel of Jesus Christ and accepted Him as their Lord and Savior. This person was a young Muslim lady who when approached by the team, at first denied that the Jesus of the Gospel ever existed but rather she said, he was an ordinary prophet who died a shameful death and never resurrected as claimed by the Bible and the team who were witnessing to her. The team patiently listened to her denial and then handed her one of the tracts. I don’t know which tract it was, but it was obviously anointed by the Holy Spirit because after reading it tears began to flow and run down her cheeks. Through those tear-filled eyes, she looked up and asked, “How can I know your Jesus?”. As they walked together, the team explained how salvation is by repentance of sins and faith in the death and resurrection of Jesus Christ. She then accepted Jesus as her Lord and Savior, the same Jesus that just a few minutes before, she had even denied His existence. That, my friend, is the power of God working by His Spirit to change lives and increase the population of the Kingdom of Heaven. It was not by a “hard-sell” or coercion by the evangelism team that changed her mind in just minutes. It was through words of the true Gospel of Jesus Christ. This tells us that the word of God is like a sword that can cut and separate the soul from the spirit of man/woman and reveal to his/her corrupt and natural spirit the love of God, regardless of the spiritual condition of that person. This usually results in a person’s acceptance of Jesus as Savior. You might ask, why separate the soul from the spirit? God created man as a three-part being: spirit, soul, and body. Man is a spirit, he has a soul and lives in a body. His spirit is that part of him that is prone to fellowship with God. Since the fall of Adam, man’s soul is that part of him that makes decisions, reasons, etc., and is more prone to please the flesh (body) than it is to please the spirit. According to the scripture previously quoted, the Gospel of Jesus Christ is the only thing able to come between spirit and soul, allowing the spirit to overcome the desires of the soul to please the flesh (body). Instead, as the spirit grows in faith by hearing the Gospel, the soul begins to come more in line with the spirit. The body sometimes bears the burden of the new alignment of spirit and soul. Fasting is a good example. Before receiving Jesus as Savior, a person’s soul tends to make decisions based on the desires of the body. Example: The body gets hungry. The soul says, “Find food, fast!” The natural spirit of man doesn’t even have a say in the matter. You might say it is overruled by the soul and body. After accepting Jesus as Savior, the natural spirit of man is replaced by the presence of the Holy Spirit. The soul takes a “back-seat” as the Holy Spirit leads man/woman in the ways of God. Accepting Jesus as Lord is easily stated in the beginning but difficult to commit to as a lifestyle. God realizes this and patiently waits for us to grow in and by His Spirit. This is called sanctification. Sanctification is an on-going process of the soul coming more and more in line as we study God’s Word, as we pray, meditate and increase in faith. We should never get discouraged if we sometimes fall back into occasional sin. That is the time to ask forgiveness and the help of the Holy Spirit to avoid the same sin in the future. As we do this, we are growing in the ways of God and letting Him become the Lord of our lives. May the Holy Spirit lead and guide you as you grow in the Lord.